One of the best things about having a dressing room is that everything is out in the open. I’m not great at pre-planning my outfits each day, so this allows me to view most all of my clothes and accessories as I get ready. I dry my hair and turn to look at my current clothes (current meaning the current season, which I keep on the open rack) to figure out what I’ll put on. I’ve only had my clothes in there for over a month and I’m already amazed at how much less frustrating it is to have them all in front of me. Same goes for my accessories. I probably should have cleaned this up more but this is generally how it looks. I’ve actually had this vintage blue garden rake for my necklaces for years. It’s an old Country Living idea, I believe. It sits to the left of my mirror and inspires my outfits, but is also just a fun piece of artwork in itself. The little knobs at the bottom are my favorite part. 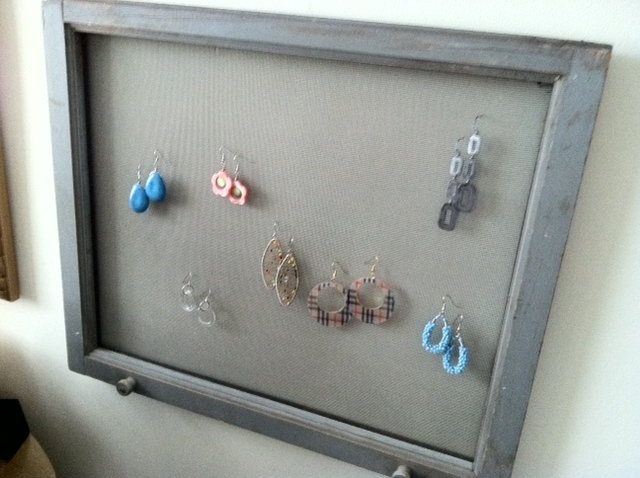 This screen hangs some of my earrings and is a new addition to this room. I picked it up for $12 on the same day I got the vintage coat rack. I love the slate bluish gray color and love that I didn’t have to do anything to it except put a couple nails up and hang it. One of my next projects is to create a clever cork board to display some of my magazine clippings. I also may use some of my metal trays with some simple magnets to accomplish the same thing. Any simple idea that makes your getting-ready routine easier? Please share. 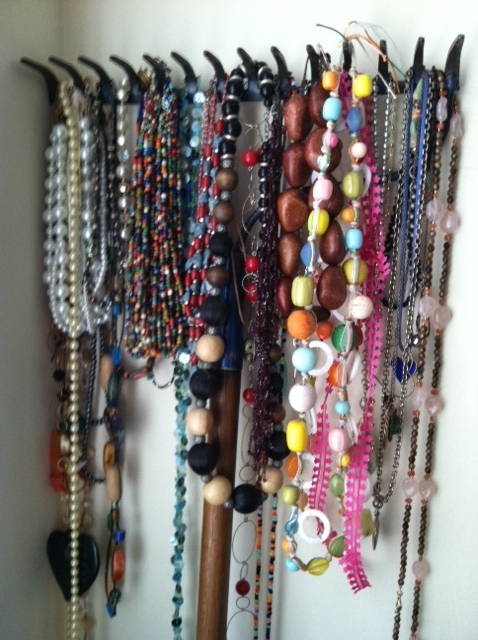 I like the rake for a place to put your necklaces, very innovative!